If you are quite undecided whether to go rustic or elegant on your wedding, I suggest you read on… because today, I will show you that you can actually combine the two! Fuse the natural textures and organic feel of a rustic wedding with touches of glitz and elegant gold, and you have got your dream Rustic Luxe wedding. 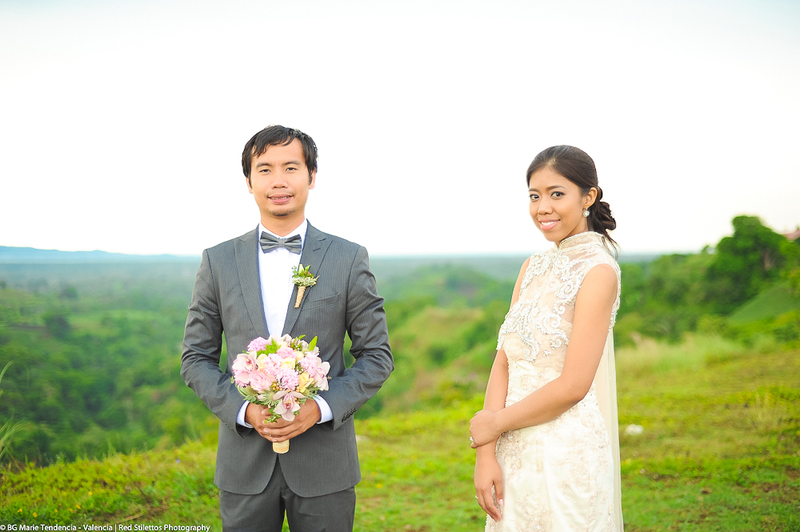 Today’s couple, Dutch and Rodney, chose this theme and had a refreshing Tagaytay wedding splashed in the most yummy shades of pinks, yellows and greens. The bride, Dutch, was radiant in her sequined bridal dress which she herself designed. Despite planning the wedding from Dubai, Dutch made sure she was hands-on on the wedding preparations and even DIY-ed some of the deets herself. I love how their reception stylist, K. by Cunanan, executed oh-so-beautifully the balance between the rawness of a rustic theme and the crisp style of a luxe wedding. Here are the deets to steal: the delicate lace table runners, paper doilies placed over the napkins then tied with jute, use of the metallic touches of gold, the clear jars and bottles used as vases and were filled with soft flowers, the use of votives to create gorgeous luminaries, and the added touch of raw wood for natural texture. It is such a delight that their chosen photographer, Red Stilletos Photography, was able to snap up every last glorious detail and moment in this wedding. The photos are all so refreshingly clear and subtly dramatic. I love how each photo evoke the right emotions, thus, creating a magical affinity with its viewer and makes you feel as if you were there – a guest at the wedding.